I'm getting a serious Vanilla Ice/Michael Jackson situation vibe here. The bridges are different but it's almost the exact same melody. Has anyone brought this up (or other instances like this) before? Or are they nothing alike and I just have that bad of an ear for this sort of thing? Amazing article from (usually sub par) Polygon about FF, in the creators own words. Is it amazing enough to deserve it's own thread? My older brother told me last week that he'd actually intimidated his best friend's kid brother into letting him "borrow" FFVI forever in the summer of of 1995. So I'd like to take a moment to retroactively thank little Gregory Kloosterman for being too scared of a 13 year old who already had sideburns to ever ask for this masterpiece back. 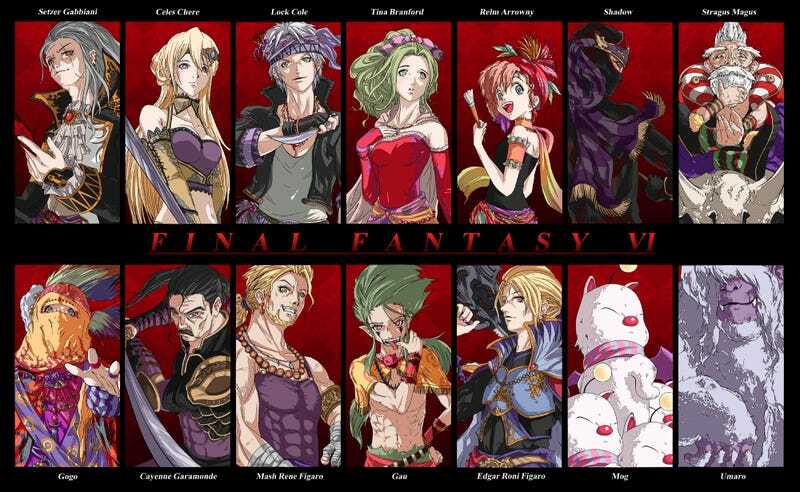 Since Final Fantasy VI is still my favorite game ever, I truly owe my subsequent lifelong love of RPG's to your cowardice. My hat's off to you, pee-pants. So what do I mean by natural magic/no esper? Only natural magic means that I will abstain from using (or learning) any magic that isn't learned simply by either leveling up or through a unique skill like Relms sketch or Gogo's mimic. For those of you who don't know (and shame on you if you don't) the overwhelming majority of magic in FFVI is learned by equipping espers or (less frequently) equipment. So, in a natural magic run, you aren't allowed to use either. This means that all rods/shields/etc. in the game that teach a spell are to be sold off or discarded and under no circumstances is magicite to be equipped to any character. A secondary effect of this is that since equipped magicite gives characters stat bonuses when gaining levels, that I'll be missing out on that too. On top off all of this, I'm going to do my best not to power level, so if I can take down Kefka in the low 50's then I'll consider that a job well done. Am I doing all of the bonus dungeons/recruiting all the extra characters?? When people (like me) get all dreamy eyed over what Nobuo used to be, they are usually thinking about something like this. 10 year old me simply couldn't function while this song was on. I don't think I ever skipped it on the original SNES. More to follow this evening after I've had a chance to like, actually start playing the game. I've been trying to clear out the chaff from my ever growing pile of games and thought it would be better to put them up for sale on here before I took them in to my local used game shop (or auction them off elsewhere). I've had good experiences with doing business with members before so it seems worth it to give things another shot. Prices are VERY negotiable. I've just come to a point where I've realized that I'll either never play or replay any of these wonderful titles ever again. All are in perfectly playable condition. kthnxbai. General Games / Do You Take the Path? This has nothing to do with branching storylines. My question is as literal as possible. If you're on a world map, and there is a dirt path/road to where you're going, do you follow it? Or do you just go the shortest straighest route?